Attendees at WonderCon 2019 got a special introduction to LAIKA Studios newest feature film Missing Link: Adventure Awaits. Not only is there a booth and panel at the convention, but there was a world premiere screening this weekend as well. Not only is this the stop motion studio’s most ambitious film yet, it also boasts some serious talent in the voice cast including Hugh Jackman, Zoe Saldana, and Zach Galifianakis. Stop motion is one of the film industry’s oldest forms of special effects: real puppets whose movements are changed and captured with each frame. LAIKA Studios has been in the forefront of creating successful stop motion animation films in the past with hits such as ParaNorman and Coraline. 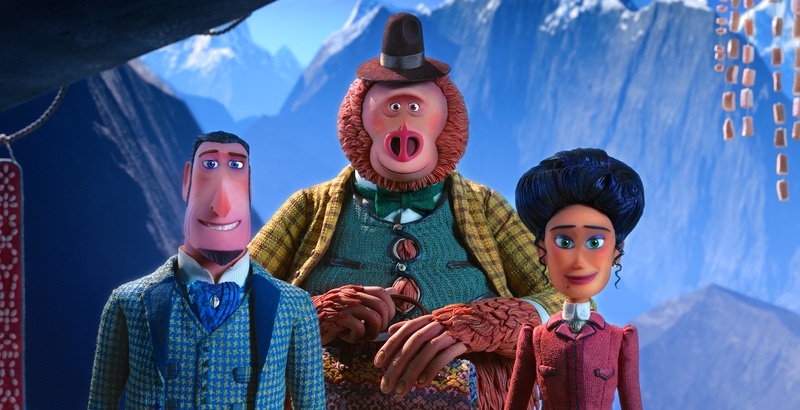 Their newest film, Missing Link, opens in theaters on April 12. The film itself was written and directed by Chris Butler based on an idea he had more than a decade ago. The story is focused on Mr. Link (voiced by Galifianakis), a yeti-type creature who is the last of his kind. He goes on a quest with Sir Lionel Frost (Jackman) and Adelina Fortnight (Saldana) in search of Shangri-La, and maybe even some of his long-lost relatives. The trio search the globe and have many adventures. We were lucky enough to attend the press room at WonderCon 2019 and learn more about the project from director Chris Butler, production designer Nelson Lowry, puppet fabrication supervisor John Craney, and producer Arianne Sutner. You can watch the roundtable interviews in full below. As you can tell from the interviews, this was a huge project for the studio. The stunning miniature sets and puppets were painstakingly complex, but yet beautiful and whimsical. Additional members of the voice cast include Timothy Olyphant, Matt Lucas, Stephen Merchant, Emma Thompson, and Amrita Acharia among others. The film opens April 12.